What path led to this extraordinary result ? 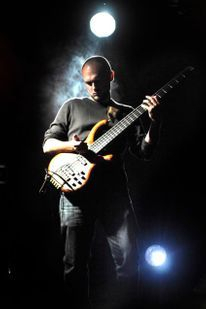 Marc was born in Brussels in 1961 and trained as an engineer and computer specialist. He is an Engineer at CERN were he makes sure particles collide correctly in the Large Hadron Collider.. He has been married to beautiful Kathleen for over 20 now and has three adorable daughters. While he is not thinking about what the universe is made of, Marc plays saxophone and relaxes by participating to Ironman races. Here's our interview with this amazing scientist-musician-athlete-family man-festival organizer. Marc: "The slogan, which portrays me the best is 'Make your life a dream and make this dream a reality' . I don't remember who said it, but it really suits me. I'm absolutely passionate about everything that life and our beautiful region offers in terms of environment, culture, and sports.bI tried to find the balance between my family life, my work at CERN and my activities in sports associations (cycling and triathlon) and music (president of the CERN Jazz Club, founder of the Monts Jura Jazz Festival, and saxophone player). 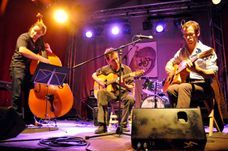 The dream of creating a jazz festival was born within Marc's musical activities, which he started in 2001. 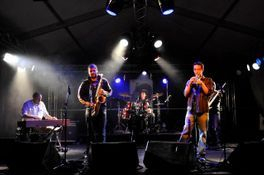 Marc: "I come from a family of musicians. My dad was a jazz pianist in Brussels, and he played in the post-war big bands. My eldest brother is a professional classical pianist and has an international career. Music has always been part of my environment. 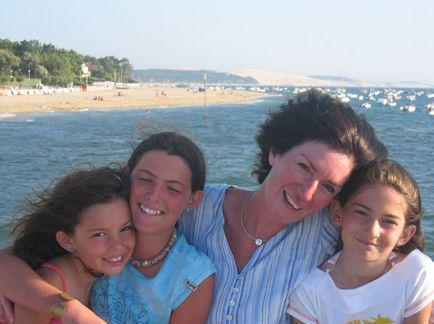 Since 2001, as a consequence of a minor health problem, I plunged into this fascinating world. For the last seven years, it has been an extraordinary experience made of wonderful encounters, of sharing and of the emotions that only music can evoke. 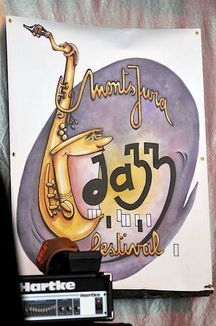 The world of music was so enriching that the idea of organizing a jazz Festival soon appeared to me. Together with some friends who share this passion we accomplished this somewhat crazy but enthralling project." But Marc's passion for music dates further back. Important events in our lives, or people who have touched our heart are often a source of deep and lasting inspiration. This inspiration may be forgotten for a long period, but it appears again at the right time. Moreover, the realisation of a dream is often anchored to a greater picture, something that extends beyond us and transforms the dream into something that is of greater use than only our personal benefit. Marc: "I've had this passion for music since I was a child. It's is probably my Dad's piano that made me always want to play music, not to speak of my bother's concerts that great impressed me. But that's life, due to my studies and my profession music stayed in the background for a long time. I've always loved the saxophone because of the way its built and its timbre which can be so close to the human voice. In 2001 I took the step, and decided to play this instrument. 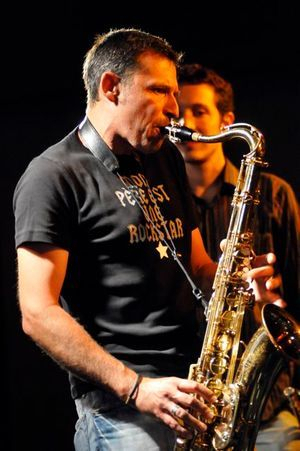 I was very lucky to soon meet a great saxophone player and teacher, Guillaume Perret, who magnified my passion for this instrument." 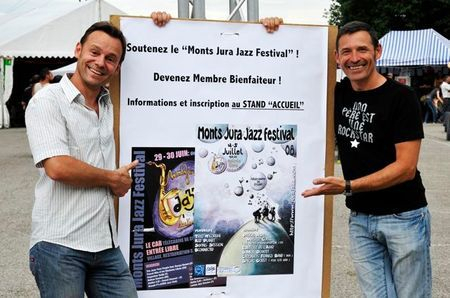 Now you may say..... Well how did this lead to the Monts Jura Jazz Festival? 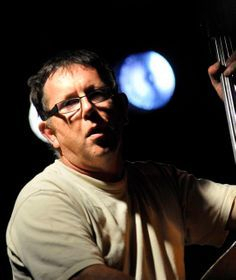 To put it simply, it's thanks to my love for jazz combined with my need to share with others projects that serve a greater purpose and trail our life with unforgettable moments." From dream to reality: it entails having enough ardour and conviction to place all of one's practical skills at the service of a seemingly impossible dream. It is said that once we decide to go ahead with a project and we direct all our energies towards it, the entire univers sets into movement with us and conspires to help us. We meet the right people and resources appear, by coincidence, just at the right time. Marc: "The first times I went to festivals like Montreux or Paléo, I was amazed by the ambiance and by what it took to organize such events. 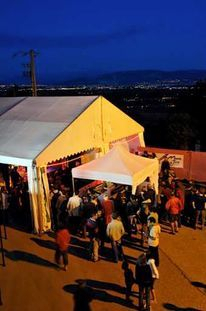 In 2006, in the CERN Jazz Club, Dominique Bodard, Jean-Pierre Riunaud and I talked about organizing a jazz festival and soon, our energies and ideas converged on this subject. Later, we met Dominique Tavier and Emmanuel Rutka who already had alot of experience in this field. I guess you can say that these two teams combined well together because they are complementary. 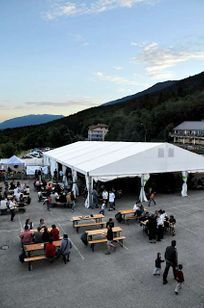 The first Monts Jura Jazz Festival (it was still called the CERN Jazz Festival then) was organized in a few months, and we know now the success it met with." Once the dream has become reality, and especially for projects that have to last in time, it is very important to continue to nourish the initial inspiration, which made the dream come true in the first place while focusing also on the concrete and practical actions that one needs to continue to undertake. Marc: " Since the first edition, a lot of people joined this initiative bringing their energy and skills. 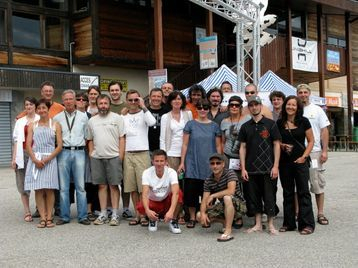 Two years later, it's great to see a team of over 50 people who work (some all year round) on the organization of the festival. 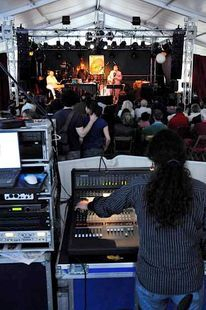 All talents are combined to ensure the success of this event: musicians, decorators, graphics, logistics specialists, cooks, sound engineers, and the treasurer (not to be forgotten!)." Before you can overcome the difficulty it is necessary to perceive it, to have an opinion about it, to consider it in one way or another. The way we view obstacles will determine the way we will deal with them. People who fulfill their passion have a very special way of looking at obstacles: for them obstacles are teachers, counselors, alerts, catalysts and agents of change and development. When faced with a difficulty, people who fulfill their passion rarely complain. They look at the obstacle and ask themselves what its message could be, in what way the obstacle could be useful to them, how can they change it or overcome it. We asked Mark - What obstacles did you meet and how did you overcome them? Marc: "Obstacles? I think we meet obstacles, small and big, every day of our life. I believe that certain obstacles are an opportunity in the sense that they show us the things that we cannot do overnight, or they indicate that our ideas and proposals have not been understood, or they simply tell us that we still have to adapt our project and our ambitions so as to avoid making irretrievable mistakes. In fact we should view obstacles as opportunities to convince others and above all, to learn! Another aspect that must not be neglected of course is the external support, and in particular support coming from public authorities and sponsors that must be convinced. This is an integral part of the project. Marc: "Quite simply, in other people! Moreover, I have a wonderful wife, who helps me to make my dreams come true! If your intentions are sincere and passionate and if you are organized in a transparent way, your ideas will resonate in others. What is important is to communicate this passion and create enthusiasm within every person you encounter. After all, what counts is for everyone to find satisfaction in the accomplishment of the project." Why do human beings have dreams and deep desires? What good is it to make so many efforts to bring our wishes into reality? What are we trying to nourish with this? To start with, we are compulsive creators, eternal inventors of something. An apple pie, the text of an e-mail, a new itinerary by car, a professional project, a work of art, an impossible dream, all day long, we create, we make, we elaborate, we invent. And we also have a deep need to be aligned with our values and to see them expressed and vibrant in our lives, for our own happiness and the happiness of others. Nothing is more satisfying than this feeling of coherence with what is most important for us. People who fulfill their passion are the creators of objects or events that are inhabited by their values. We asked Mark - What is the impact of having fulfilled your passion in your life today? and what is the impact, the effect on other people? Marc: "That's the funny thing about it. You come up with an idea and in fact, you are the one to be the most affected by it. There's one aspect I absolutely want to highlight and which has really touched me and it's that fact that even today, it is still possible to count on the generosity of others and on a community spirit. Not everything is money-driven as we so often see in society nowadays. People still love to and know how to give, unsparingly! And what if you could do it again ? Marc: "Without the slightest hesitation !"